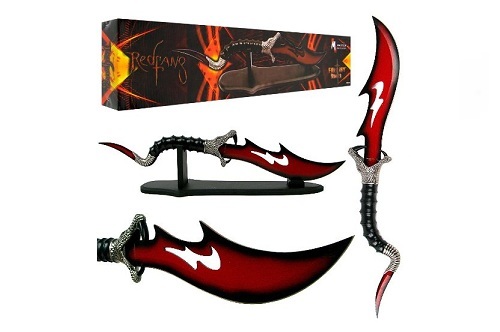 This amazingly designed fantasy blade features double the sting with a blade protruding from mouth of the snake handle as well as the tail. The blade in the mouth of the viper is stainless steel and 10.75 inches in length with a resilient red and black finish. The guard itself is a highly detailed viper design with the head cast from durable zinc aluminum. The snakelike handle of the knife fits comfortably in to your hand and is composed of contoured black plastic. Finally the knife ends in yet another blade constructed for stainless steel in a resilient red and black finish at 3.75 inches long. This incredible fantasy dagger is overall 21.5 inches in length and comes with a black stand so that you can proudly display it. Price: $34.97 & eligible for FREE Super Saver Shipping.